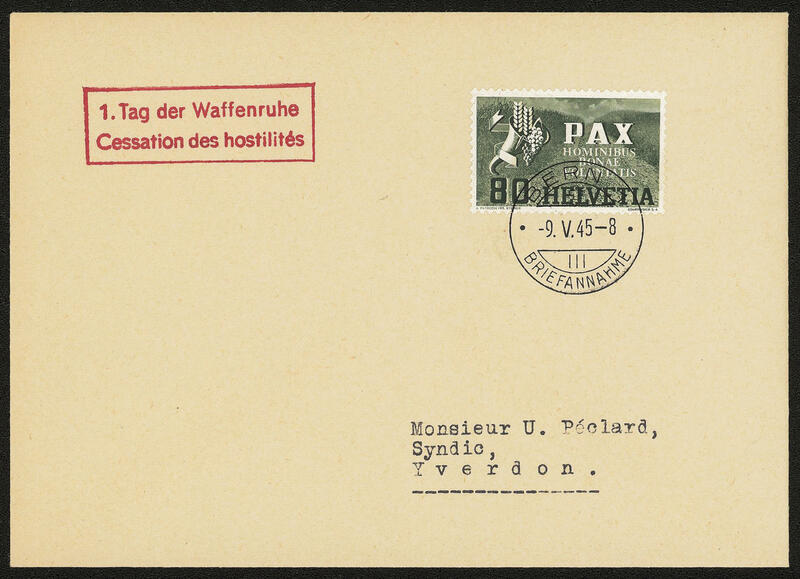 4191 FDC 447/59 PAX set 1945, all 13 values complete on 11 beautiful first day letters with perfect first day cancel \"BERN 9. V. 45. \" and additional red rectangle cancel \"1. Day the Weapons quiet / CESSATION of the HOSTILITÉS\". A dreamlike nice outstanding set for the highest standards and in this kind very rare! Certificate Liniger. 4193 ✉ 452/56ex 50 C., 80 C. And 2 Fr. 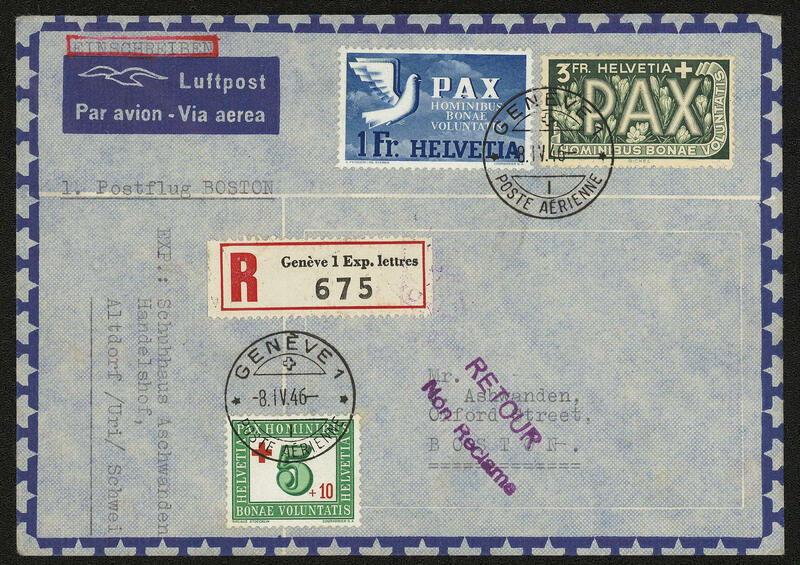 PAX on very nice register airmail letter from \"GENEVE 8. IV. 46. 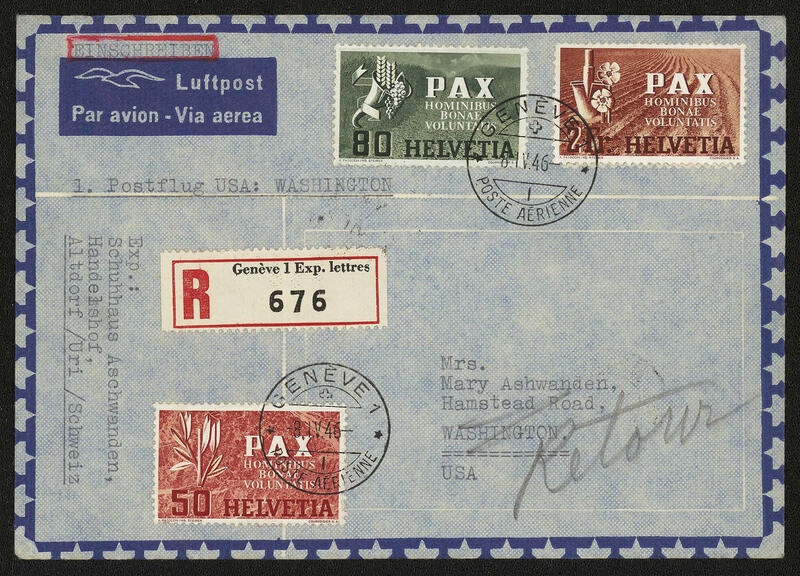 \" to Washington / USA with transit and arrival postmarks. Very decorative! 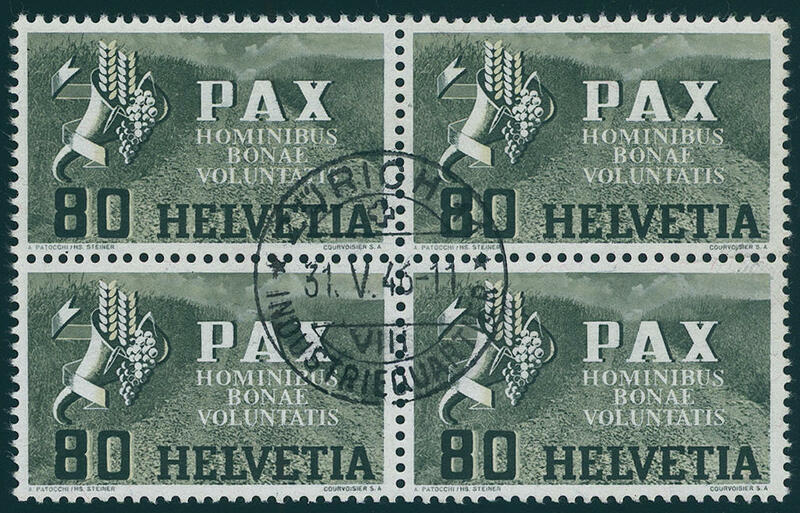 4194 ⊙ 454 80 C. PAX 1945, wonderful block of four, centric and neat cancelled \"Zurich 31. V. 46. \" in perfect condition. Photo expertize Rellstab. Michel 400,- €. 4195 ✉ 455,457 1 Fr. PAX and 3 Fr. 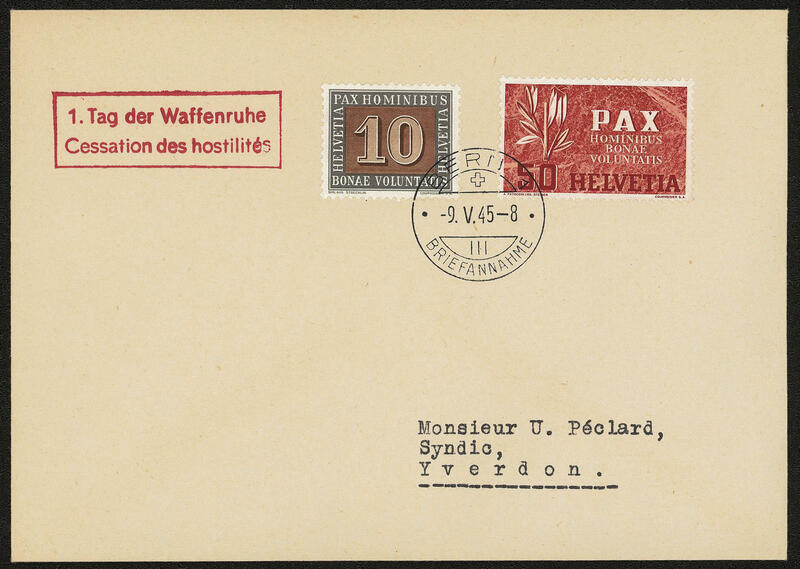 PAX with additional franking 5 C. On very nice register airmail letter from \"GENEVE 8. IV. 46. 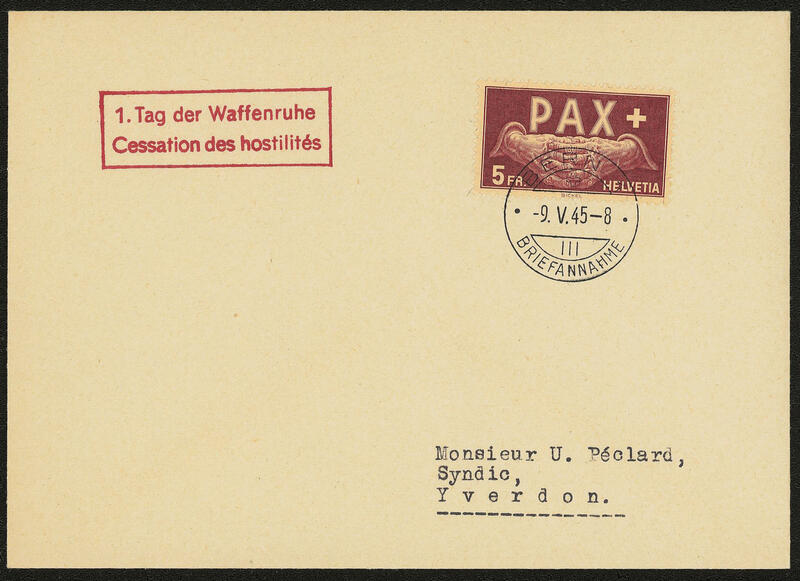 \" to Boston with transit and arrival postmarks. 4196 ✉ 458 5 Fr. 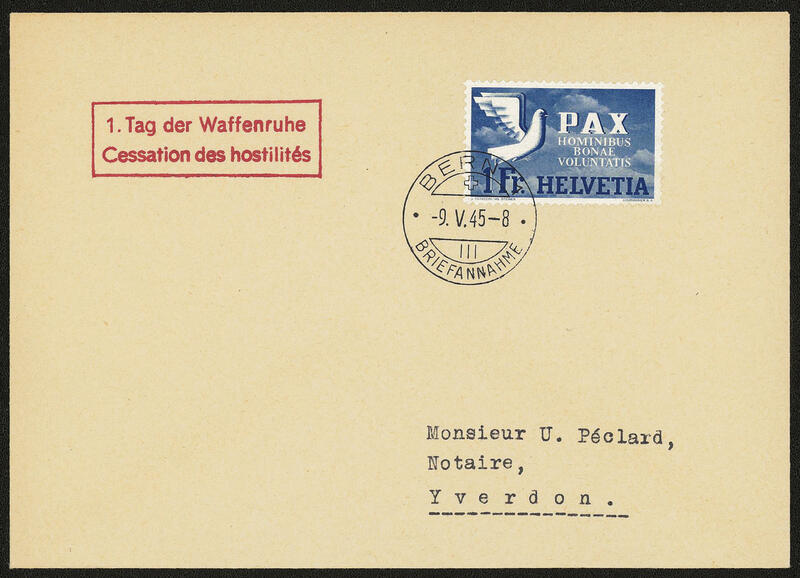 PAX 1945 with additional franking of the centerpiece from the Basler-deaf-block, in perfect condition on very nice register airmail letter from \"GENEVE 31. XII. 45. 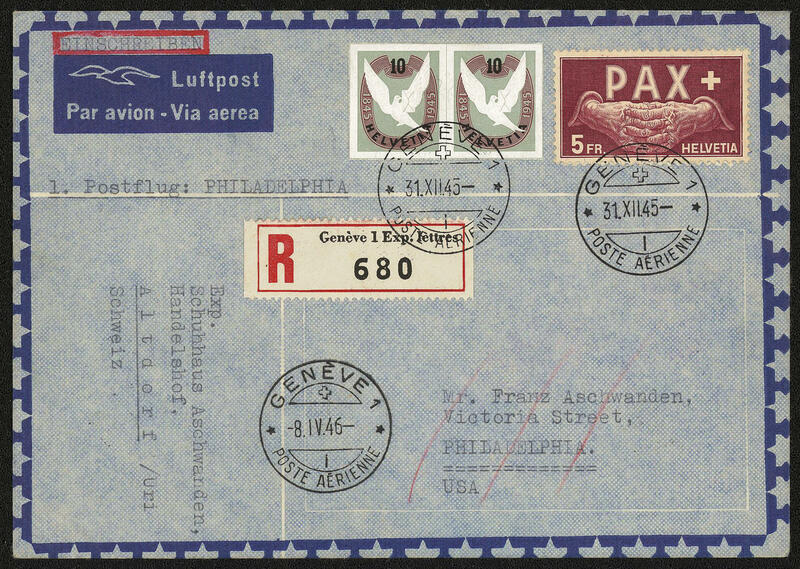 \" to Philadelphia / USA with transit and arrival postmarks. Very decorative and rare! 4197 ✉ 459 10 Fr. 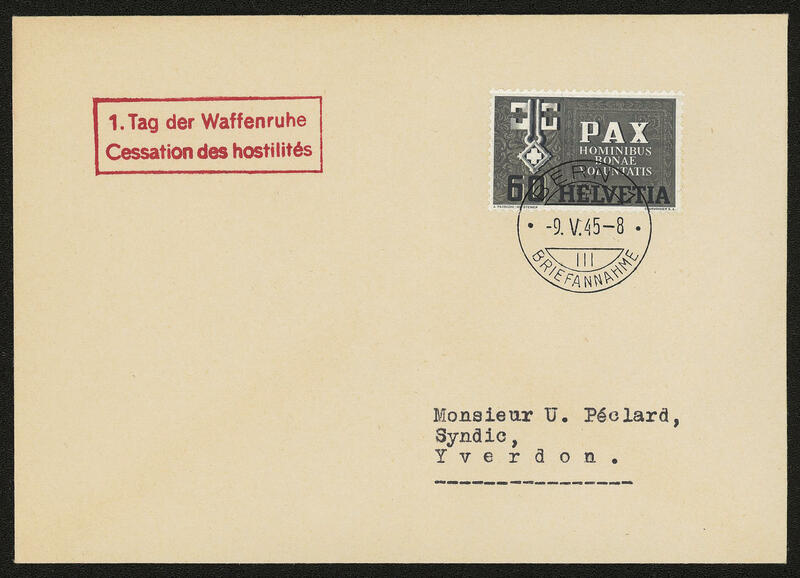 PAX 1945 with additional franking 5 C. On very nice register airmail letter from \"GENEVE 8. IV. 46. 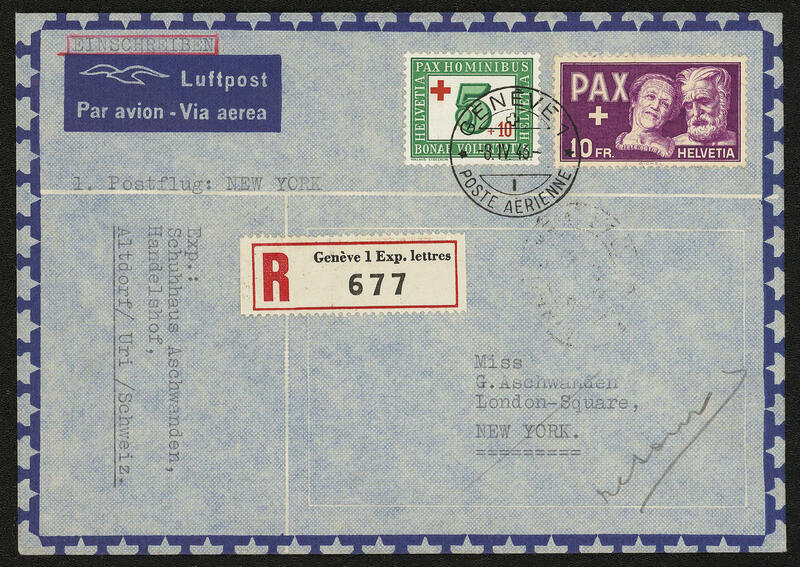 \" to New York with arrival postmark. A wonderful cover! 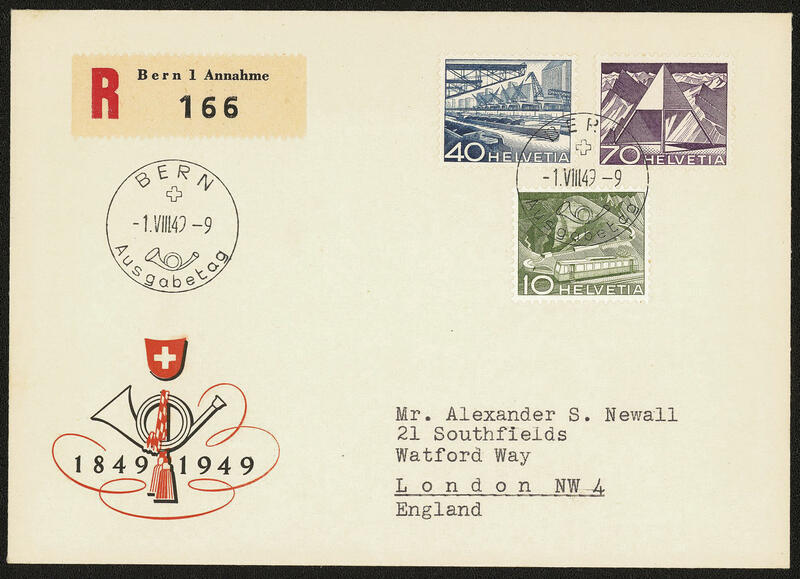 4198 FDC 460/63 Pro Patria 1945, faultless set on four very nice illustrated First Day Covers of the Alliance celebration Committees in perfect condition. Michel 450,- €. 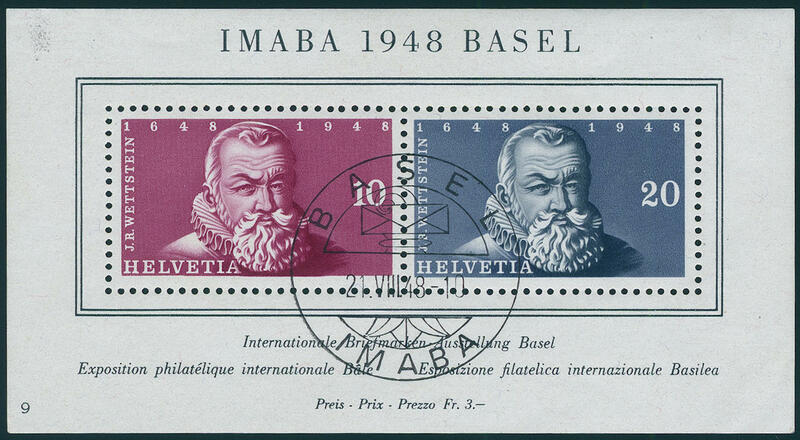 4199 Bl.13 Imaba souvenir sheet 1948, four piece, in perfect condition mint never hinged Michel 360,- €. 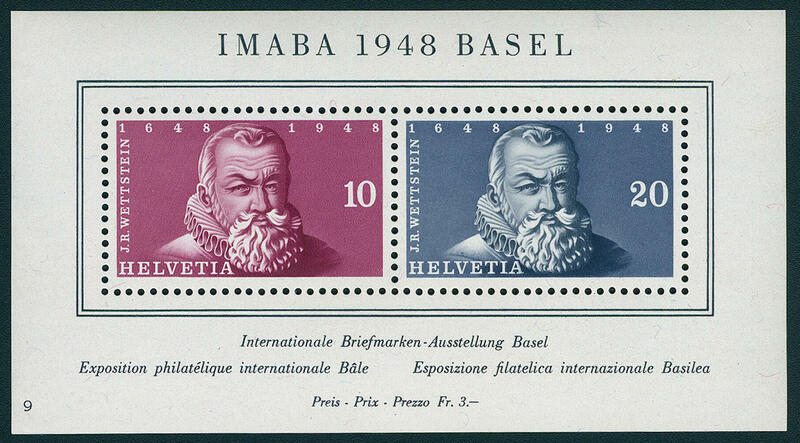 4200 ⊙ Bl.13 Imaba souvenir sheet 1948, four piece, neat cancelled, of it three with appropriate special cancel from Basle. Michel 360,- €. 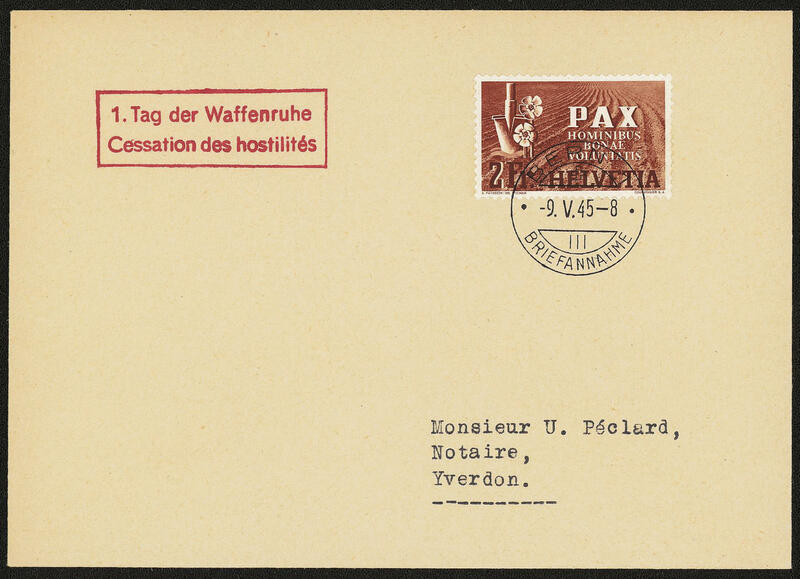 4201 FDC 529/40 Postal stamps 1949 complete on four very nice registered first day letters with first day cancel in German / French / Italian to London addressed, perfect condition. 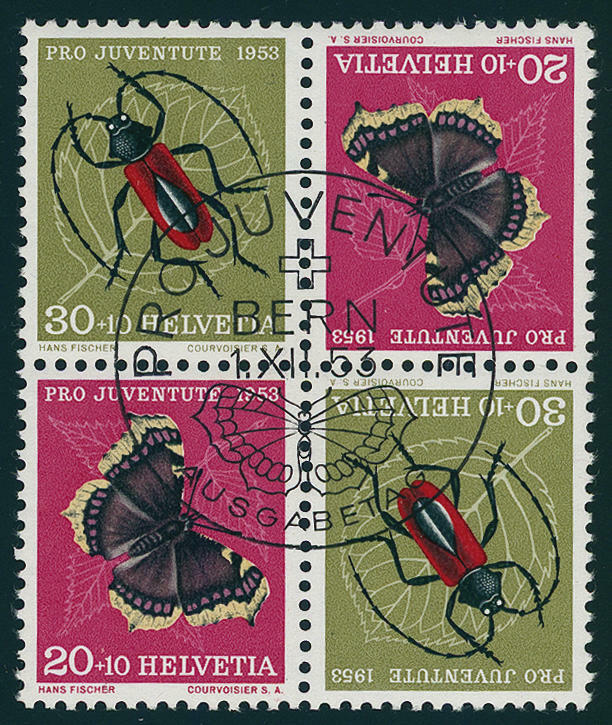 4202 533I 20 C. Brown carmine, the very scarce, so-called \"archetype\", fresh colors and very well perforated, in perfect condition mint never hinged in perfect condition. 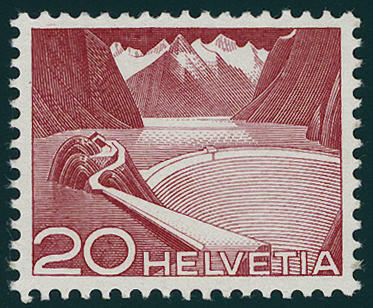 An outstanding quality this large Switzerland rarity, the in almost all collections is absent! 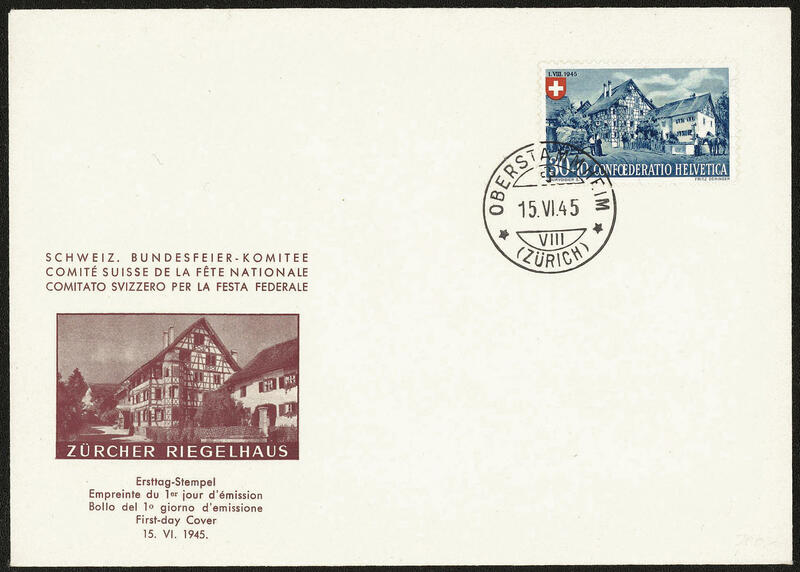 Photo expertize \"excellent and faultless condition\" Rellstab / International Association for Philatelie Experts. 4203 Bl.14 LUNABA-block 1951, in perfect condition mint never hinged Michel 280,- €. 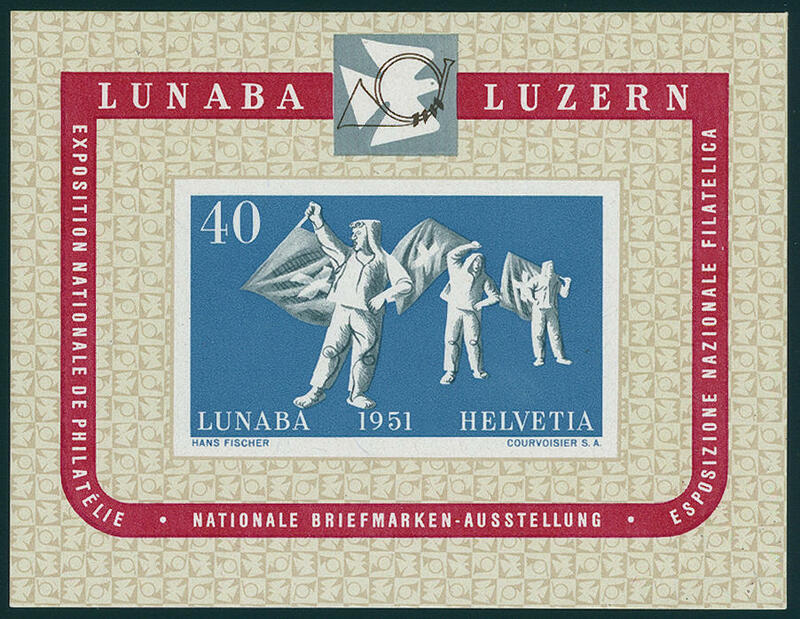 4204 ⊙ Bl.14 LUNABA-block 1951, in perfect condition with first day special cancel \"Lucerne 29. IX. 51\". Michel 200,- €. 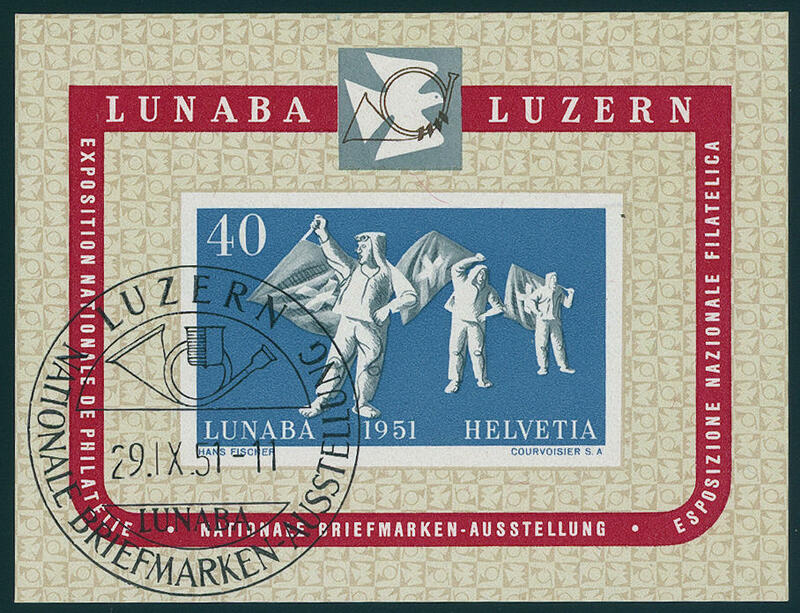 4205 ⊙ Bl.14 LUNABA-block 1951, in perfect condition with first day special cancel \"Lucerne 29. IX. 51\". Michel 200,- €. 4206 ⊙ Bl.14 LUNABA-block 1951, in perfect condition with special cancellation \"Lucerne 7. X. 51\". Michel 200,- €. 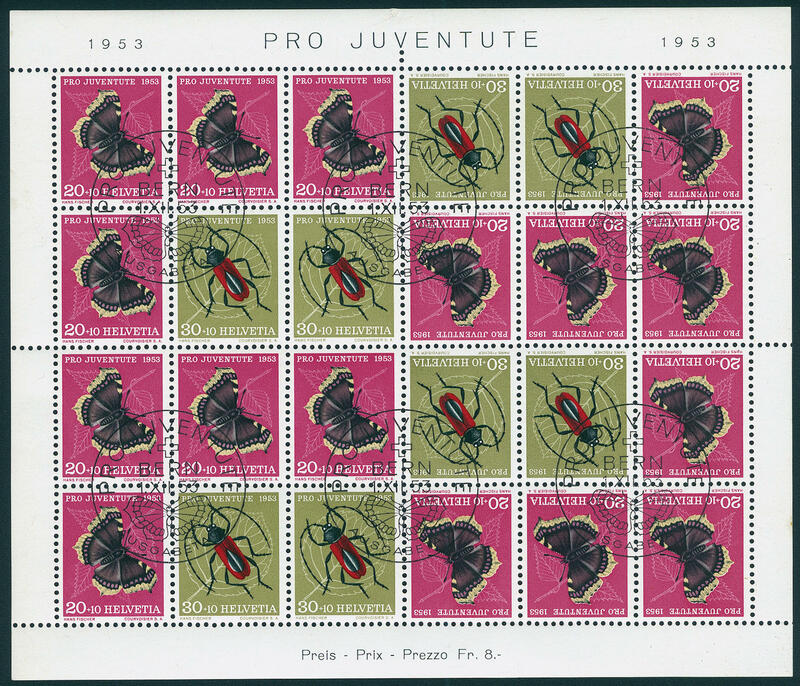 4207 ⊙ MHB42 Pro Juventute tête-bêche sheet 1953, fresh colors and in full original size, unfolded, all perfect used \"ANWIL 28. VI. 54. \". A very nice copy and with date stamp rare offered! Michel 1500,- €. 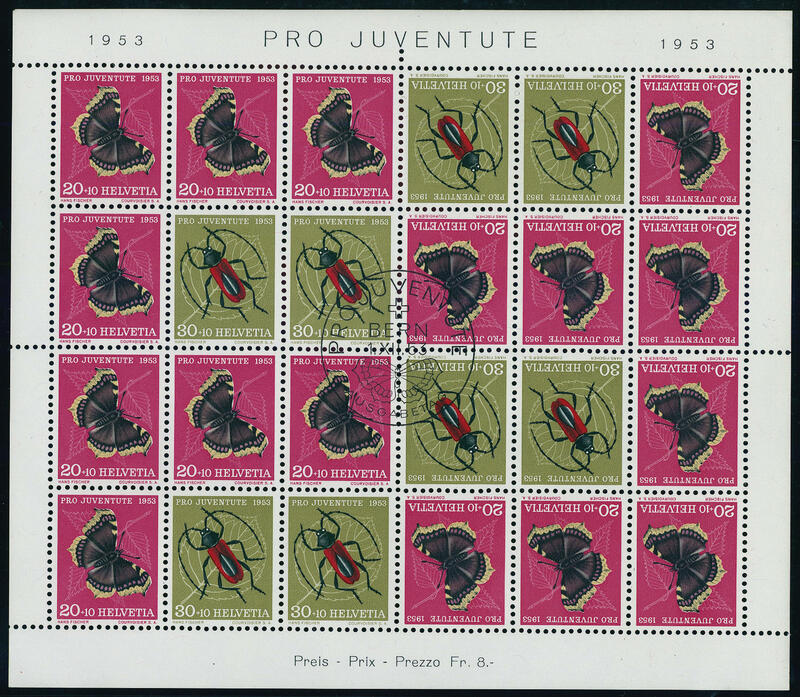 4208 ⊙ MHB42 Butterfly tête-bêche sheet 1953 with only a centric mounted first day special cancel \"BERN 1. XII. 53. \", unfolded and in perfect condition. In this kind very rare! Michel 1500,- €. 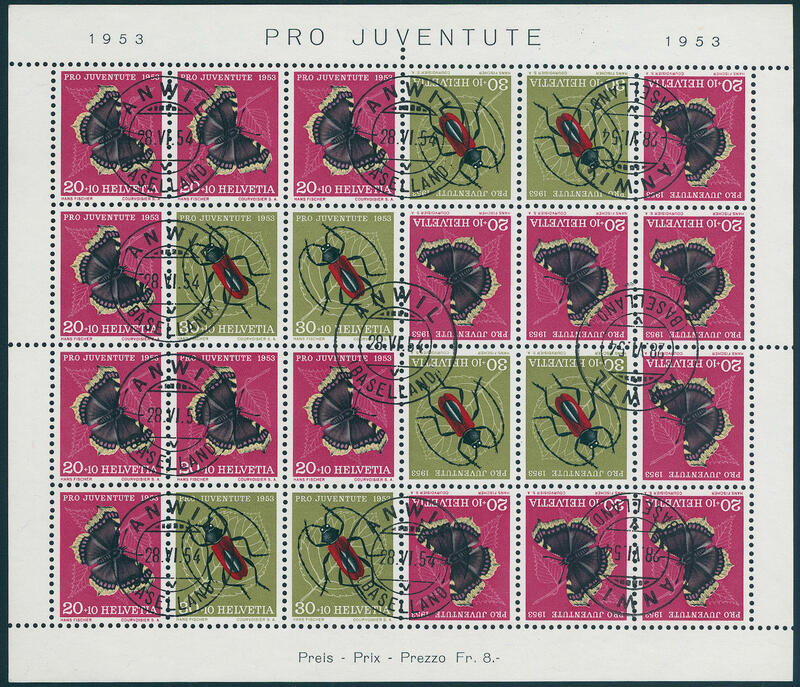 4209 ⊙ MHB42 Pro Juventute tête-bêche sheet 1953, fresh colors and in perfect condition, unfolded with perfect mounted first day special cancel \"BERN 1. XII. 53. \". Michel 1500,- €. 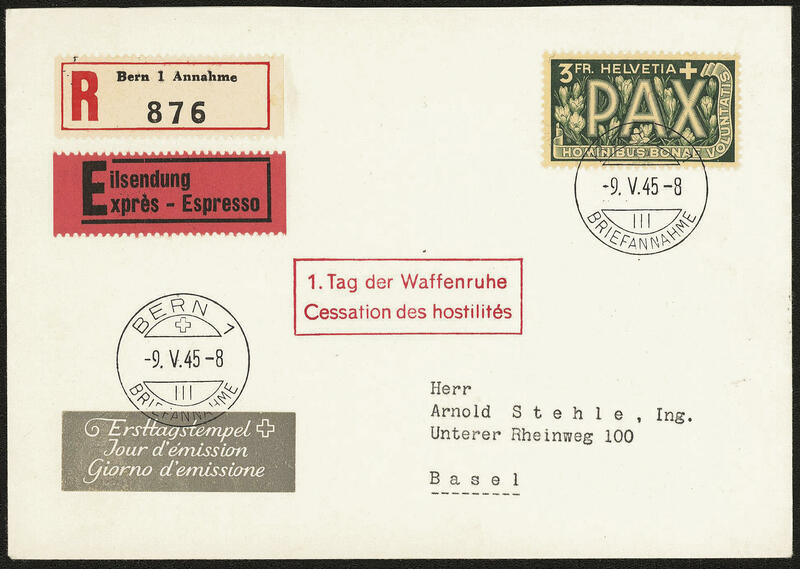 4210 ⊙ 592/93 Pro Juventute 1953, both centerpieces from the se-tenant sheet, in perfect condition with centered first days special cancellations \"BERN 1. XII. 53. \". SBK 480,- Sfr. 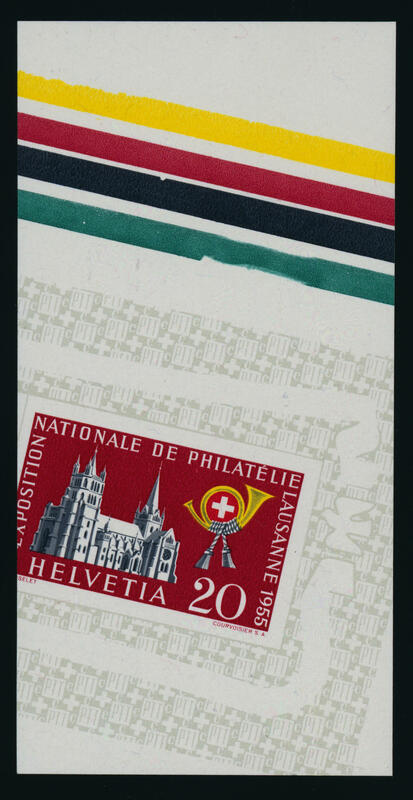 4211 Bl.15 Abart Lausanne souvenir sheet 1955 extremely strong damaged in cutting, through it without the denomination value 10 C., the 20 C. Vertical standing, left with margin color lines in green / black / red / yellow. 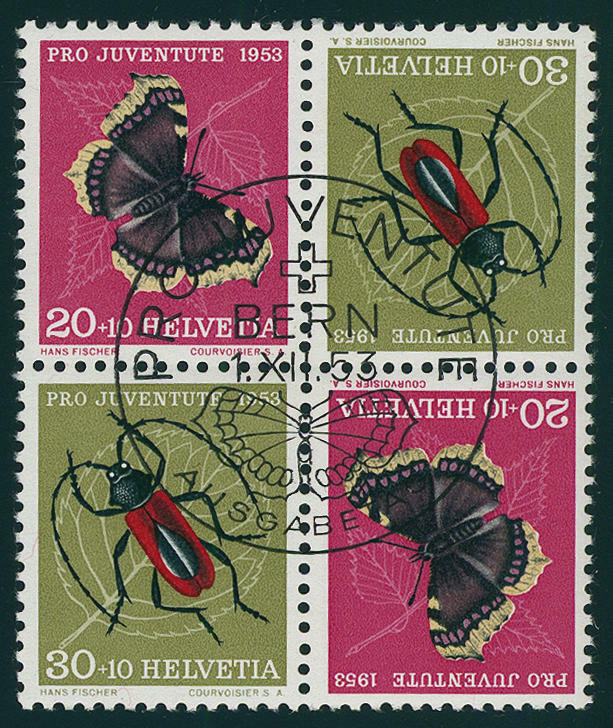 Besides is absent the green printing in the margin. A spectacular and in this kind probably unique variety, like they more impressive not be could!